Just started using VSDC. I have a MP4 video (Realillusion crazytalk) with a talking head animation with Green screen background. When I import it into VSDC and remove the Green screen, it changes the background to black - I want the background to be transparent because I want to import the video into Adobe Captivate. 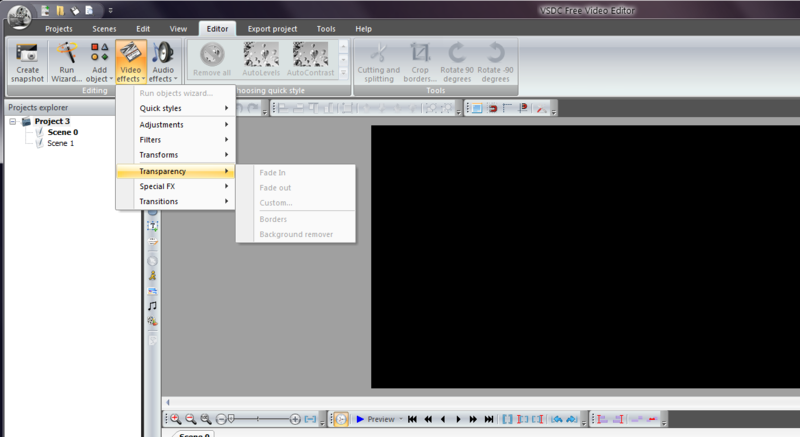 I export it as a FLV using the default settings and when I insert it into Adobe Captivate, the background is still black. What do I need to do in VDSC to overcome this? Do I need to use Adobe Media Encoder after exporting? With the version 2.2.2, you have the possibility to create videos with semitransparency. The developer said that codecs have been added to support semitransparency (PNG, lossless JPEG) and the GIF format. You can select the option after you've loaded the video file. Use the Background Remover option from Video Effects > Transparency > Background Remove.